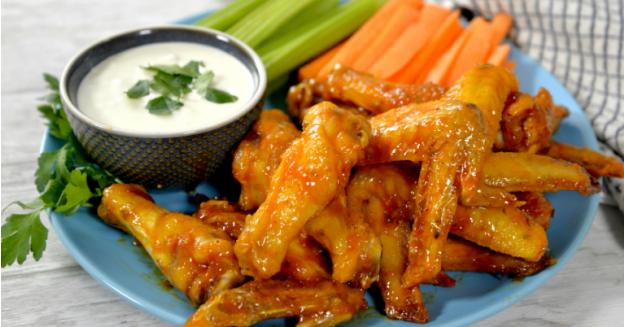 Nothing satisfies spicy chicken cravings quite like a batch of crunchy, well-sauced buffalo wings. I'm talking the traditional bone-in, messy, "we'll need some hand wipes" kind of wings that aren't finished until you've gnawed off every last bit of meat. There's nothing elegant or classy about it, but that's what makes them a quintessential bar food—they truly are finger-lickin' good. 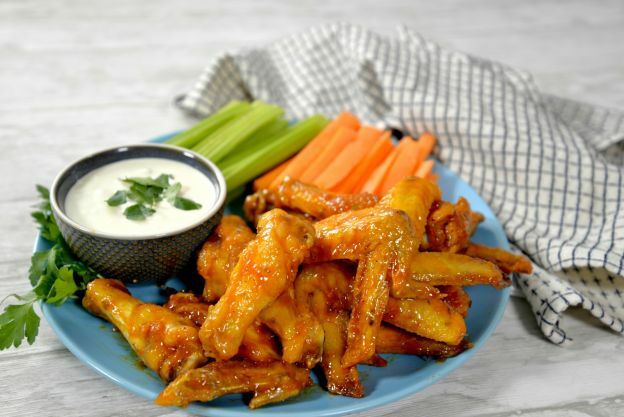 While some purists will never stray from their beloved traditional buffalo sauce, I've got too curious a palate to forgo the countless possible variations. A brief serving stint at Buffalo Wild Wings in college surely helped my curiosity along. There, I was able to test at least a dozen different sauces and discovered that making wings is incredibly simple. They're deep-fried and tossed in sauce, or "handspun" as B-Dubs affectionately termed it. Armed with that knowledge, I knew that making wings at home would be easy. But there is a downside: all that oil. I'd always been much less curious about the amount of oil that goes into fried foods and content to remain oblivious for as long as I planned to eat them. What's more, making them at home can be a tedious, messy process and leave your house smelling like the inside of an actual deep fryer. 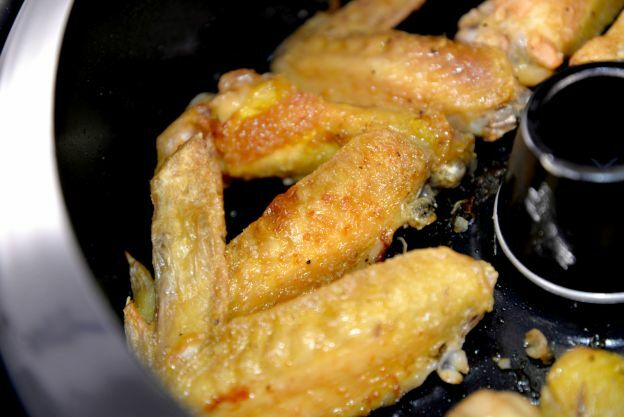 Ultimately, we decided to test out air fryer chicken wings in the Gourmandize kitchen. And I gotta tell you: we are sold! No, they didn't come out tasting exactly like their deep-fried counterparts, but they had a satisfying crisped skin and were remarkably easy to make. The Tefal air fryer requires little preparation for this recipe and doesn't need to be preheated. Just give it a quick spray or brush of cooking oil before adding the wings, which should be coated in baking powder. The baking powder is what will give the wings their crispy texture, so it's an essential component. To put a spin on the classic sauce, we decided to use Frank's Red Hot Chile 'N Lime Sauce, which is tangy and mildly spicy. The lime flavor stands out nicely, and you can throw in a whole minced jalapeno for extra kick. To add sweetness and a sticky texture, use honey and simmer until the sauce thickens. The minced jalapeno should no longer be visible in the sauce when ready. When the wings and sauce are cooked, toss them together until your chicken is coated and glossy. 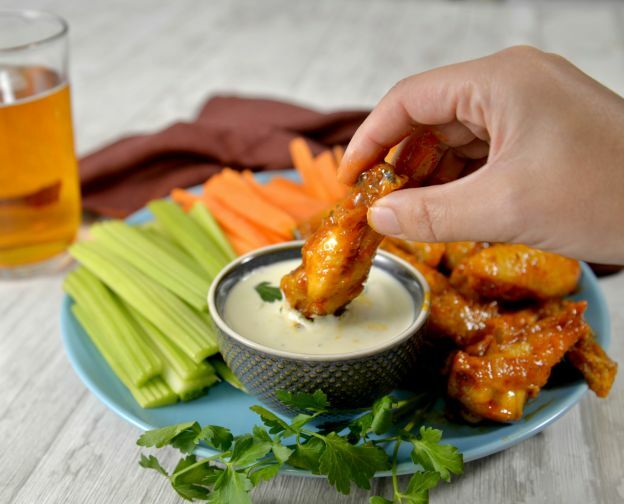 The combination of tang, spice and sweetness is a winning trio, with just the right amount of heat to please wing-eaters with varying degrees of tolerance (you can always swap in a spicier hot sauce, if desired). Get the full recipe below. *You can sub Frank's Red Hot Sauce Original or Frank's Red Hot Wings sauce, if desired. For a chunkier sauce, you can roughly chop the jalapeno instead. For this recipe, we used the chicken function on Tefal's Actifry Genius FZ760, which has adjustable heat settings and a timer. We cooked the wings in two batches to avoid overcrowding. You can find a similar black and green model online here. Coating the chicken in baking powder before air frying is what gives it that crispy texture. Don't skip this step! 1. 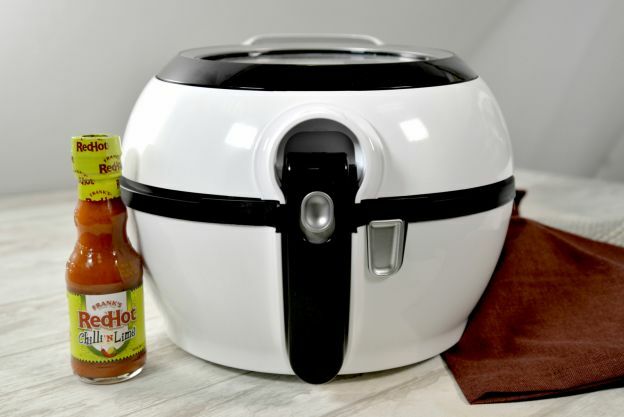 Lightly oil air fryer basket or coat with cooking spray. 2. Pat the wings dry, and season with salt and pepper. 3. Add the baking powder to a large bowl and toss the wings in it until coated. 4. 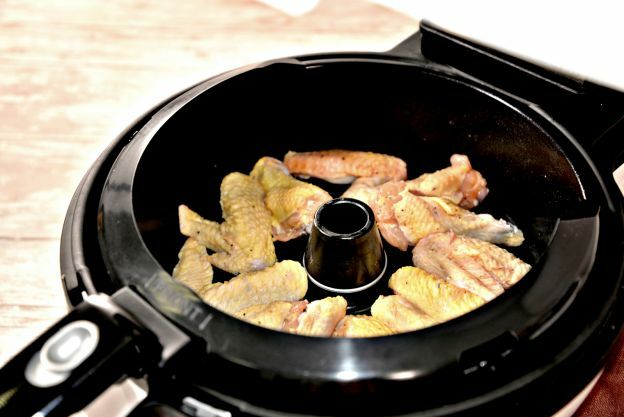 Add the chicken wings to the air fryer, and select the chicken function. Set the temperature to 400°F for 15 minutes (no need to pre-heat the air fryer). 5. When the 15 minutes are up, flip the wings with tongs. 6. Let cook for about 5 more minutes or until the skin is nicely browned and crispy. Do this in batches if necessary, to avoid overcrowding the air fryer. 7. Meanwhile, prepare the sauce. Add all sauce ingredients to a medium saucepan over medium-low heat. 8. Let the sauce simmer until thickened, stirring often, about 8-10 minutes. 9. Toss the cooked chicken wings with the sauce until coated all over. Hungry for more? This cheesy, savory pretzel challah bread is absolutely irresistible.